Old-school blackboards, white chalk, slates, yellow pencils and oak desks were the inspiration for this big set - with an apple for teacher of course. (Four sets actually, as the new 2D shaped mug is also included. Cupcake wrapper too! all thank you cards and gifts solved in one set. • A tea cup topper card or postcard - no shape cutting for smaller kids. • Two instruction sheets for assembly of the cards. 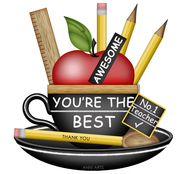 Perfect as a thank you card and teabag gift for the end of the school year, with lots of different tags and word patches to ring the changes. In this set, the pencil teaspoon is already in the saucer and in the mug handle, so no need to cut and add. It makes it easier for younger children. Adding a cupcake in matching cupcake wrap makes for a lovely gift set that won't break the bank. The shaped cards definitely need paper of printable cardstock weight if the teabag is to be added. I added lots of white chalk to the blackboard so there is less black to print. But as they are special graphics one will only print once a year, I didn't worry too much about the ink usage. Also, one will use just one or two products, so there is no need to print all the items - and the colour-in sets use almost no ink! 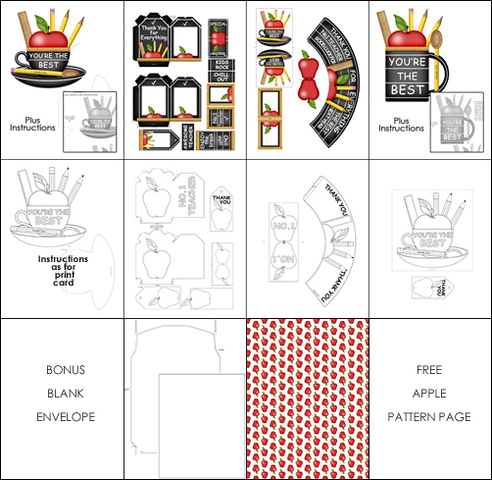 with versatile apple repeat pattern that coordinates with the Teacher's Apple crafts and line art set. TIP 2: The cradle teacup or shaped mug can also be pasted on a backing of apple paper for a square card. The shape of the cup or mug can be raised for a dimensional card. TIP 3: The Teacher's Apple range has a bonus blank envelope. Print the apple pattern first, then print the envelope on top for an envelope with an all-over apple design. LET ME KNOW YOUR SUGGESTIONS!